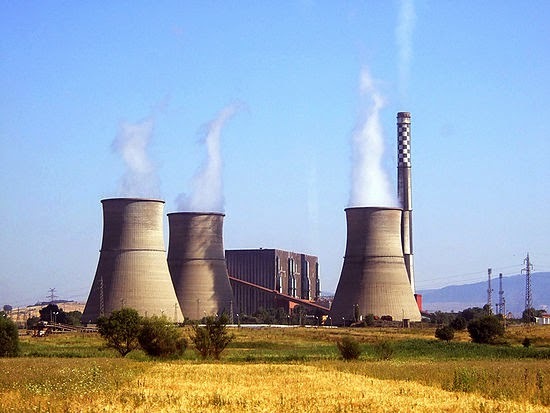 Steam power stations converts heat energy of coal combustion into electrical energy. A steam power station basically works on the Rankine cycle. Steam is produced in the boiler by utilising the heat of coal combustion. The steam is then expanded in the prime mover (i.e., steam turbine) and is condensed in a condenser to be fed into the boiler again. The steam turbine drives the alternator which converts mechanical energy of the turbine into electrical energy. Although steam power station simply involves the conversion of heat of coal combustion into electrical energy, yet it embraces many arrangements for proper working and efficiency. The schematic arrangement of a modern steam power station is shown in figures below. 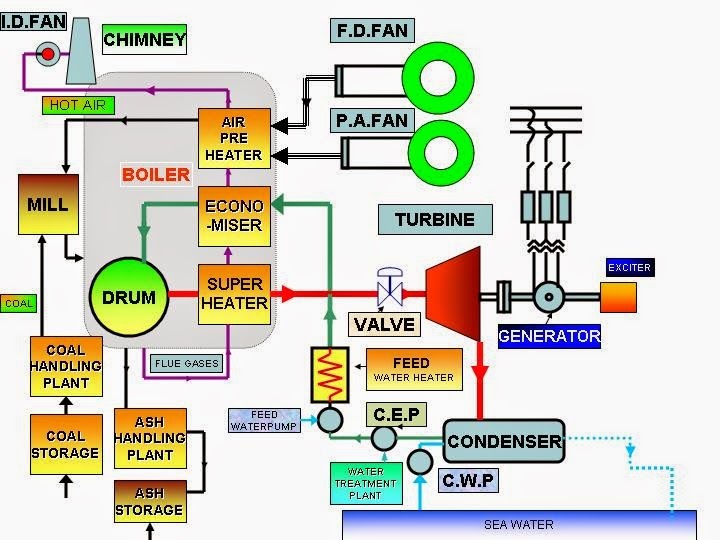 Steam Power Plant – Schematic arrangement. The coal is transported to the power station by road or rail and is stored in the coal storage plant. Storage of coal is primarily a matter of protection against coal strikes, failure of transportation system and general coal shortages. From the coal storage plant, coal is delivered to the coal handling plant where it is pulverised (i.e., crushed into small pieces) in order to increase its surface exposure, thus promoting rapid combustion without using large quantity of excess air. The pulverised coal is fed to the boiler by belt conveyors. The coal is burnt in the boiler and the ash produced after the complete combustion of coal is removed to the ash handling plant and then delivered to the ash storage plant for disposal. The removal of the ash from the boiler furnace is necessary for proper burning of coal. It is worthwhile to give a passing reference to the amount of coal burnt and ash produced in a modern thermal power station. A 100 MW station operating at 50% load factor may burn about 20,000 tons of coal per month and ash produced may be to the tune of 10% to 15% of coal fired i.e., 2,000 to 3,000 tons. In fact, in a thermal station, about 50% to 60% of the total operating cost consists of fuel purchasing and its handling. The steam generating plant consists of a boiler for the production of steam and other auxiliary equipment for the utilisation of flue gases. (i) Boiler. The heat of combustion of coal in the boiler is utilised to convert water into steam at high temperature and pressure. The flue gases from the boiler make their journey through superheater, economiser, air pre-heater and are finally exhausted to atmosphere through the chimney. (ii) Superheater. The steam produced in the boiler is wet and is passed through a superheater where it is dried and superheated (i.e., steam temperature increased above that of boiling point of water) by the flue gases on their way to chimney. Superheating provides two principal benefits. Firstly, the overall efficiency is increased. Secondly, too much condensation in the last stages of turbine (which would cause blade corrosion) is avoided. The superheated steam from the superheater is fed to steam turbine through the main valve. (iii) Economiser. An economiser is essentially a feed water heater and derives heat from the flue gases for this purpose. The feed water is fed to the economiser before supplying to the boiler. The economiser extracts a part of heat of flue gases to increase the feed water temperature. (iv) Air preheater. An air preheater increases the temperature of the air supplied for coal burning by deriving heat from flue gases. Air is drawn from the atmosphere by a forced draught fan and is passed through air preheater before supplying to the boiler furnace. The air preheater extracts heat from flue gases and increases the temperature of air used for coal combustion. The principal benefits of preheating the air are : increased thermal efficiency and increased steam capacity per square metre of boiler surface. The dry and superheated steam from the superheater is fed to the steam turbine through main valve. The heat energy of steam when passing over the blades of turbine is converted into mechanical energy. After giving heat energy to the turbine, the steam is exhausted to the condenser which condenses the exhausted steam by means of cold water circulation. The steam turbine is coupled to an alternator. The alternator converts mechanical energy of turbine into electrical energy. The electrical output from the alternator is delivered to the bus bars through transformer, circuit breakers and isolators. The condensate from the condenser is used as feed water to the boiler. Some water may be lost in the cycle which is suitably made up from external source. The feed water on its way to the boiler is heated by water heaters and economiser. This helps in raising the overall efficiency of the plant. In order to improve the efficiency of the plant, the steam exhausted from the turbine is condensed* by means of a condenser. Water is drawn from a natural source of supply such as a river, canal or lake and is circulated through the condenser. The circulating water takes up the heat of the exhausted steam and itself becomes hot. This hot water coming out from the condenser is discharged at a suitable location down the river. In case the availability of water from the source of supply is not assured throughout the year, cooling towers are used. During the scarcity of water in the river, hot water from the condenser is passed on to the cooling towers where it is cooled. The cold water from the cooling tower is reused in the condenser.